The Hailey maternity top features side ruching that will grow with you throughout your pregnancy and also looks fabulous post-pregnancy. Long sleeves and a scoop neck. Tees by Tina is a "non-maternity" brand but we have found that their amazing pieces offer so much all over stretch as well as incredible recovery that they work beautifully for pregnancy and will become a wardrobe staple for many years to come. The top is a one-size-fits-most, size 4 through 14! The Tees by Tina brand has been seen on pregnant celebrities such as Kim Kardashian, Molly Sims and Malin Akerman. This style staple is perfect under a jacket at work or amazing with jeans on the weekend! Flattering micro stripe pattern, scoop neckline and long length make this tank a must-have for every season! Stretchy fabric covers your bump while pregnant, retracts back to fit your slimmer shape after baby. Ingrid & Isabel's Weightless Tees are woven from ultra-soft Supima� cotton to gracefully expand with your belly and recover after washing. 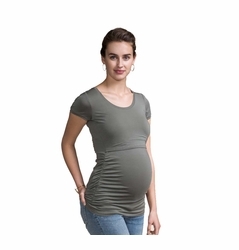 Cut extra-long to gather just below your hips, this V-neck tee's easy fit offers full coverage at every stage of pregnancy--even after. If you like a fitted look, we recommend a smaller size. Available in Grey, Black, Aubergine (Purple), and White.